Alberto Patishtán is not a French kidnapper like Florence Cassez, nor a drug trafficker like Rafael Caro Quintero, nor one of the assassins of the Acteal massacre. He is a Tzotzil teacher, a member of the Other Campaign, who has been unjustly imprisoned for the last 13 years. She, they and he are not the same. The justice system set Cassez, Caro Quintero and the paramilitaries from Chenalhó free even though they are guilty, while it keeps the teacher Patishtán in prison despite his innocence. The judiciary at this time had the possibility to make amends for the damage done to the indigenous Tzotzil from the municipality of El Bosque. But on Thursday, the First Collegiate Tribunal of the Twentieth Circuit based in Chiapas declared the evidence by which his lawyers sought to obtain his acquittal to be unfounded. Adding dishonour to shame, the Supreme Court of Justice of the Nation decided to be an accomplice of injustice and washed their hands. Only last March, their First Chamber decided, by three votes to two, not to retain jurisdiction over the motion for recognition of the teacher's innocence. The case was returned to the tribunal which declared the evidence in favour of Patishtán to be unfounded. In a country where the administration of justice has a strong political bias and where the judges are rarely independent of the Executive, the decision of the judges of the First Collegiate Tribunal of the Twentieth Circuit, Freddy Gabriel Celis Fuentes, Manuel de Jesús Suárez Rosales and Eduardo Arturo Garduño Zenteno, can only be interpreted as a message from the State. A message sent both to the prisoner himself and to those who see him as emblematic of the struggle against injustice. The teacher is a hostage of power. Alberto Patishtán is not just any detainee: he is the country's most notorious political prisoner. He is an emblematic figure of the indigenous movement, in whom racial discrimination, procedural carelessness and the partisan use of justice to deprive original peoples are all summed up; a symbol of dignity against the abuse of power. Literally thousands of voices inside and outside Mexico have demanded his immediate liberation. The Believing People, the EZLN, the indigenous movement, the National Coordinating Committee of Education Workers (CNTE), Amnesty International and hundreds of human rights organisations and public intellectuals are convinced of his innocence and demand his freedom. It is to these that the State delivered its last word: your reasons do not matter to me; I hear you, but I take no notice. The story is well known. On July 12, 2000, in the hamlet of Las Lagunas de Las Limas, Simojovel, seven policemen were ambushed. On that day and at that time, Patishtán was many kilometres away from that place. It did not matter. They held him responsible for the murders anyway. He was sentenced on charges of organized crime, intentional homicide, possession of weapons for the exclusive use of the armed forces, and bodily injuries. There were no translators at his trial. The witnesses lied and did not present solid evidence of his guilt. The judges did not care. He went to prison. Throughout the country, the indigenous peoples resist environmental devastation and dispossession of their lands, territories, waters and seeds. To defend themselves in the face of public insecurity, they have formed community police. Keeping Patishtán in prison is a warning from the Mexico of above about what may happen if they continue to persist with the same obstinacy in the defence of their natural resources and of their ways of exercising justice. Hundreds of thousands of teachers are demanding the repeal of the labour reforms recently approved by Congress disguised as reforms of education. In their demonstrations and their list of demands, they insist that the detained teacher, one of their own, be released. Refusing to release him from prison is a warning of what awaits them if they do not stop their acts of disobedience. The Zapatista movement is determined to be self-governing and to keep its weapons, on the periphery of government institutions. It continues to be a source of inspiration and example to many indigenous communities in the country. Having a member of the Other Campaign behind bars is a warning that the war against the rebels in south-eastern Mexico has not ended. In a country where the law is regularly applied contrary to justice, the Mexican State does not care whether Alberto Patishtán is innocent or if his trial was full of irregularities. It does not trouble them that his imprisonment is an international scandal. The State wants, plainly and simply, to send a message to those who sympathize with the teacher and his cause to take warning. It will not succeed. 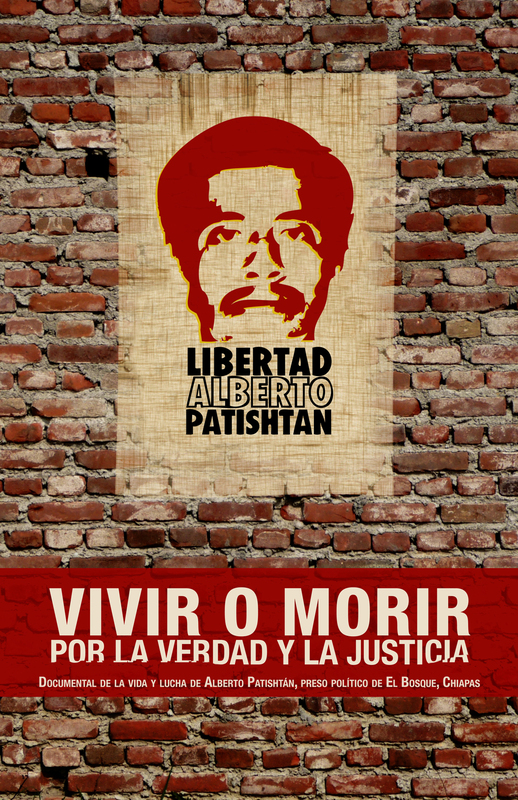 Like Patishtán, the many who stand in solidarity with him resist, and will continue resisting. fuera culpable. Los que deberían hacer justicia tampoco son justos.